Corrections officials faced with rising populations and shrinking budgets have increasingly welcomed "faith-based" providers offering services at no cost to help meet the needs of inmates. Drawing from three years of on-site research, this book utilizes survey analysis along with life-history interviews of inmates and staff to explore the history, purpose, and functioning of the Inmate Minister program at Louisiana State Penitentiary (aka "Angola"), America’s largest maximum-security prison. This book takes seriously attributions from inmates that faith is helpful for "surviving prison" and explores the implications of religious programming for an American corrections system in crisis, featuring high recidivism, dehumanizing violence, and often draconian punishments. 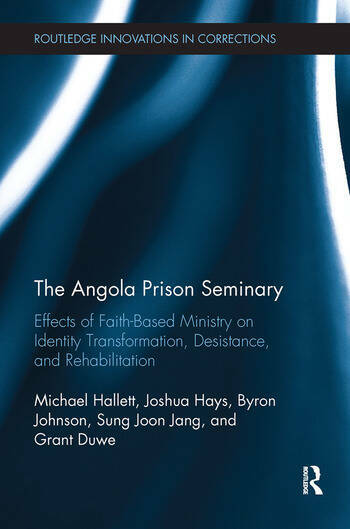 A first-of-its-kind prototype in a quickly expanding policy arena, Angola’s unique Inmate Minister program deploys trained graduates of the New Orleans Baptist Theological Seminary in bi-vocational pastoral service roles throughout the prison. Inmates lead their own congregations and serve in lay-ministry capacities in hospice, cell block visitation, delivery of familial death notifications to fellow inmates, "sidewalk counseling" and tier ministry, officiating inmate funerals, and delivering "care packages" to indigent prisoners. Life-history interviews uncover deep-level change in self-identity corresponding with a growing body of research on identity change and religiously motivated desistance. The concluding chapter addresses concerns regarding the First Amendment, the dysfunctional state of U.S. corrections, and directions for future research. Angola: "Human Life Had No Value"
Michael Hallett is a Professor in the Department of Criminology & Criminal Justice at the University of North Florida. His work has appeared in numerous books and journals including Punishment & Society, Journal of Offender Rehabilitation, Contemporary Justice Review, Critical Criminology and others. In 2006, Dr. Hallett received the Gandhi, King Ikeda Award from Morehouse College for his book Private Prisons in America: A Critical Race Perspective (University of Illinois Press). Dr. Hallett received the Outstanding Graduate Alumnus Award from his doctoral alma mater, Arizona State University, in 2007. He currently also serves as a Senior Research Fellow at Baylor University’s Institute for Studies of Religion. Dr. Hallett has been principal investigator on grants from the US Department of Justice, Florida Department of Juvenile Justice, Jesse Ball DuPont Foundation and several other organizations. Joshua Hays is a Research Fellow at Baylor University’s Institute for Studies of Religion. A graduate of Union University and of Beeson Divinity School at Samford University, he also serves as the co-editor for the proceedings of the Christianity in the Academy Conference. Byron Johnson is Distinguished Professor of the Social Sciences at Baylor University. He is the founding director of the Baylor Institute for Studies of Religion (ISR) as well as director of the Program on Prosocial Behavior. He is a leading authority on the scientific study of religion, the efficacy of faith-based organizations, and criminal justice. Recent publications have examined the impact of faith-based programs on recidivism reduction and prisoner reentry. Before joining the faculty at Baylor University, Johnson directed research centers at Vanderbilt University and the University of Pennsylvania. Professor Johnson recently completed a series of studies for the Department of Justice on the role of religion in prosocial youth behavior and has served as a member of the Coordinating Council for Juvenile Justice and Delinquency Prevention (Presidential Appointment). He has been project director/PI on many grants from private foundations as well as federal agencies including the Department of Justice, Department of Defense, U. S. Institute of Peace, Department of Labor, and the National Institutes of Health. Sung Joon Jang is Research Professor of Criminology and co-director of the Program on Prosocial Behavior within Baylor’s Institute for Studies of Religion (ISR). Before joining Baylor University, Jang held appointments at Ohio State University and Louisiana State University. His research focuses on the effects of religion and spirituality as well as family, school, and peers on crime and delinquency. His research has been published in social scientific journals in the fields of sociology, criminology, psychology and social work. Dr. Jang is the founding President of the Korean Society of Criminology in America and has been active in many capacities in the American Society of Criminology. Grant Duwe is the Director of Research and Evaluation for the Minnesota Department of Corrections. Dr. Duwe is the author of the book "Mass Murder in the United States: A History" (McFarland and Company, Inc.), and he has written more than 40 articles that have been published in peer-reviewed academic journals such as Criminology,Criminology and Public Policy, Criminal Justice and Behavior, and Sexual Abuse: A Journal of Research and Treatment. He is the 2014 recipient of the American Society of Criminology’s (Division on Corrections and Sentencing) Practitioner Research Award, and he was the 2013 recipient of the Academy of Criminal Justice Sciences’ Donal MacNamara Outstanding Publication Award for his evaluation of a prison reentry program published in Justice Quarterly.